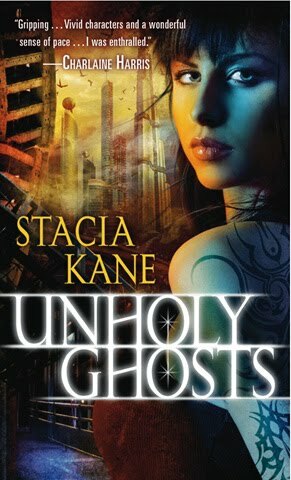 I was a little premature showing off the re-designed cover on Saturday for Stacia Kane's Unholy Ghosts, the first book in her new Chess Putnam series. Apparently the publisher says it is good to go now. 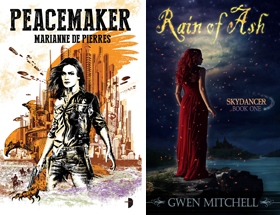 You can see the original cover here and read an excerpt here. The book is due for release in the US in June 2010 to be followed by Unholy Magic and City of Ghosts on successive months. Got to love new series that are launched back to back with little or no wait between books. I love that cover, although I liked the first one too. Plus the story sounds interesting too. Both covers are awesome but I seriously love this one! The other cover was nice but I really love this one...There are so many tatooed people on the covers lately and I LOVE it! This sounds like a real interesting story...something different! Cover got my attention but the blurb did it for me. Wendy I agree with you and Kay. I think they're both good but the newer is stronger. Kris any book blurb that uses the word 'nefarious' has my attention. Oh I really like that tattoo! chichaihana there is certainly something 'otherworldly' about her. Nice cover though! Lady_tink it seems to be the new style - kind of a House of Night derivative.